The World leader in enthusiast PC components and hardware, Corsair announced the availability of the Carbide SPEC-ALPHA Mid-Tower ATX Case at Consumer Electronics Show (CES) 2016. Spec-Alpha is the latest chassis to ditch 5.25in optical bays in preference of a smaller overall profile and direct front-to-back airflow path. Speaking of airflow, three 120mm fans will be included as standard, and also the chassis integrates a three-speed fan controller. With its modern, angular appearance, the new SPEC-ALPHA really stands out in a crowd. There’s plenty of modern features inside too, with native 3.0 USB support, room for up to four SSDs, and a three-speed fan controller for the three included 120mm fans, enabling users to set their own cooling sweet spot. A large window shows off your internal components and the direct airflow path layout, that’s provide superior cooling by getting rid of unnecessary drive bays. The SPEC-ALPHA is able to accommodate a front mounted 240mm radiator compatible, allowing for additional liquid-cooling upgrades. The exclusion of such a feature means that there is more space for other hardware; in SPEC-ALPHA’s instance, the front cooling system has a clear pathway to direct airflow across the sys. Such a decision can only improve the effectiveness of the cooling for critical components within an enclosure. Available in three distinct color options – white and red, black and grey and black and red, SPEC-ALPHA offers sophisticated angled styling whichever version you choose. 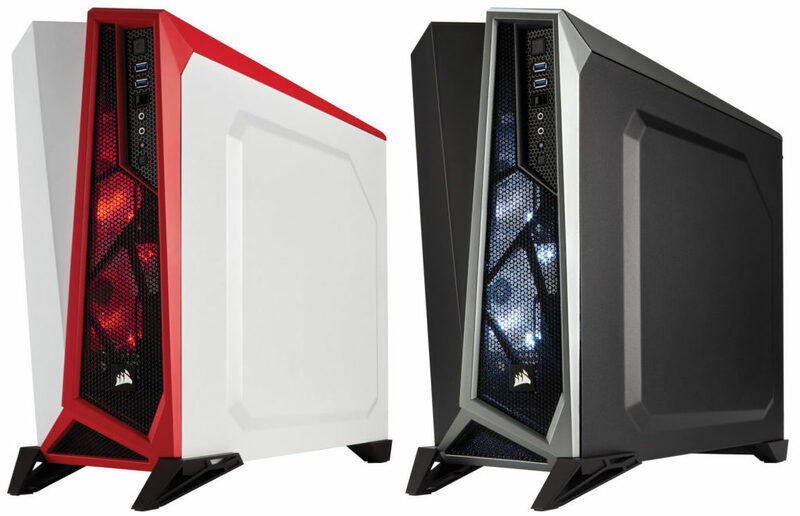 The Carbide Series SPEC-ALPHA is now available along with an MSRP of $79.99 from Corsair’s worldwide network of retailers and distributors and is backed by a comprehensive 2 year warranty and Corsair’s worldwide customer support network.